Holding the dice in a set way is essential to a cheat's throwing technique in a game of Craps. In a game of Craps, the cheat can use a number of different combinations of placing and holding the two dice in his hand with the Lock Grip when using the Blanket Roll or Rhythm Rolling to change the odds of losing combinations from landing face-up. The mistake many dice setters make is to concentrate on the values facing upward on the dice. The correct way to set dice is to concentrate on the spotted numbers that are facing together on the insides of the two dice. This is because you don't know how the dice will rotate before coming to rest, only that the inner and outer values can't be the resulting numbers. Learn the dice sets as described below and you will be a much more proficient dice setter and controlled shooter/roller. Numbers on one die are in red and the other in blue. If 6 or 1 and 6 or 1 are facing each other in the cheats hand, and the Blanket Roll or Rhythm Rolling is used, then the dice cannot come up craps (2, 3 or 12) or 11. He can win with a 7, or roll a point number, but he can't lose on the come out roll. Should he throw a point, then he may hold the dice with differing numbers facing each other and change the odds of making it. 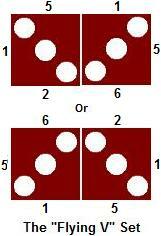 When trying for a 4, the two sides can be held with 6 or 1 and 4 or 3 facing together, giving the cheat an even chance instead of odds of 2 to1 against. When trying for 5 or 9, the two sides can be held with 6 or 1 and 5 or 2 facing together, giving the cheat an even chance instead of odds of 3 to 2 against. When trying for 6 or 8, the two sides can be held again with 6 or 1 and 5 or 2 facing together, giving the cheat odds of 3 to 2 in his favour instead of odds of 6 to 5 against. . When trying to make 6 or 8, the hardway, the cheat cuts the odds from 10 to 1 down to 3 to 1. When trying to make 4 or 10, the hardway, the cheat cuts the odds from 8 to 1 down to 3 to 1. This isn't the full story. To learn more on this technique see the Craps Dice Setting Scam .